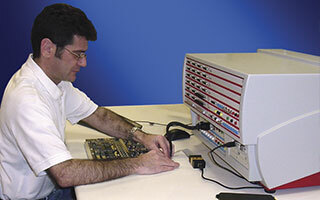 By integrating the XJTAG boundary scan system with its PinPoint II printed circuit board diagnostic system, DiagnoSYS has been able to address boards with multiple ball grid array devices and deliver improved test coverage, yield and customer satisfaction on numerous projects including missile systems, propulsion and braking cradles, and industrial control units. The PinPoint II PCB diagnostic system is a flagship product for DiagnoSYS, and is one of the fastest and most economical functional test workstations available. It is a powerful diagnostic tool for use on virtually any digital or hybrid circuit board and is used at hundreds of commercial and military sites worldwide for the diagnosis of faults down to component level. Combining several different test techniques, PinPoint is able to test a wide variety of components, including memories, processors, programmable, analogue and discrete devices, connectors and traces. However, faced with a rapidly increasing number of boards featuring boundary scan or JTAG-enabled ball grid array (BGA) devices – many of which are inaccessible to traditional test methods – DiagnoSYS sought to find a boundary scan technology partner. The company looked at all the major players and opted for the XJTAG system as it had the functionality required, was priced competitively and integrated well with the PinPoint system. Tim Webb, a director at DiagnoSYS Systems Inc. in Florida, USA, said: “By integrating XJTAG with our PinPoint II printed circuit board diagnostic system, we have been able to address boards with multiple ball grid array devices and deliver improved test coverage, yield and customer satisfaction on numerous projects including missile systems, propulsion and braking cradles, and industrial control units”. The XJTAG development system is a cost-effective ‘out-of-the-box’ solution for debugging, testing, programming and servicing electronic printed circuit boards and systems throughout the product lifecycle. XJTAG enables engineers to test a high proportion of the circuit (both boundary scan and cluster devices) including BGA and chip scale packages, such as SDRAMs, Ethernet controllers, video interfaces, Flash memories, field programmable gate arrays and microprocessors. DiagnoSYS has also integrated XJTAG into its PinPoint-UDA (Universal Design Architecture) diagnostic subsystem. PinPoint-UDA can be integrated into third-party functional test sets to provi­de PCB component level diagnostics, increased In-Circuit test and diagnostic capability, and it allows systems to be networked together. Like the PinPoint system, XJTAG is simple and easy to use, competitively priced, and, unlike many other boundary scan systems, the XJEase test scripts are device-centric making them re-usable throughout the product lifecycle. With ‘XJTAG Inside’, we can confidently tackle products with embedded boundary scan and continue to offer our customers high test coverage, fast fixture set up, yield improvement and significantly reduced test costs. DiagnoSYS is a global supplier of innovative electronic test and diagnostic solutions. Established in 1991, the company is headquartered at Petersfield in the UK and has operations in the USA, France, Germany, India, Sweden and a network of distributors worldwide. DiagnoSYS provides complete solutions in electronic diagnostics and test to a wide variety of industries, including military, avionics, transportation, telecommunication and third party repair. Customers include, among others, BAE Systems, Celestica, Motorola, Bombardier, Alstom, Kawasaki, the United States Department of Defense, Lockheed Martin, Boeing and Rockwell.